OMICS Group takes pleasure in announcing the 4th International Conference and Expo in Nanotek with the aim of tracking the most recent advancements in nanotechnology and Nanoscience, including Pharmaceutics, Nanomedicine, Applications of Nanotechnology in Materials Research, Synthesis, and Fabrication during December 01-03, 2014 in San Francisco, USA. Several prominent speakers from across the globe that are part of Nanotek-2014 include Claudio Nicolini, Nanoworld Institute, Italy; Haruo Sugi, Teikyo University School of Medicine, Japan; Jim Klostergaard, MD Anderson Cancer Center, The University of Texas, USA; Israel Felner, The Hebrew University, Israel; Jean-Paul (Moshe) Lellouche, Bar-Ilan University, Israel; John F. Donegan, Trinity College Dublin, Ireland; Ashok K. Vaseashta, International Clean Water Institute, USA,; Kimihisa Yamamoto, Tokyo Institute of Technology, Japan; Serhii Shafraniuk, Northwestern University, USA; Mark Kester, NanoSTAR Institute of the University of Virginia, USA; Bjarne Bogen, University of Oslo and Oslo University Hospital, Norway; and Moinuddin Sarker, Natural State Research, Inc., USA. 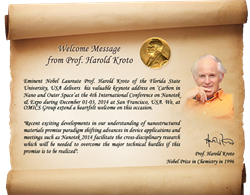 Eminent Nobel Laureate Prof. Harold Kroto of the Florida State University, USA delivers keynote address on 'Carbon in Nano and Outer Space’. On this occasion he described Nanotek-2014 as "Recent and exciting developments in our understanding of nanostructured materials promise paradigm shifting advances in device applications.Meetings such as Nanotek 2014 facilitate the cross-disciplinary research which will be needed to overcome the major technical hurdles if this promise is to be realized." OMICS Group Journal of Nanomedicine & Nanotechnology, Journal of Nanomedicine & Biotherapeutic Discovery and Journal of Nanomaterials & Molecular Nanotechnology supports the OMICS Group International’s Nanotek-2014 by publishing all the accepted and presented abstracts as proceeings. This international conference will focus on many interesting scientific sessions such as Nanomaterials, Nanostructures, Nanomedicine, Nanodevices and Nanosensors, Materials science and Engineering, Nanoelectronics, Nanotechnology in Energy Systems, Environment, Health and Safety Issues of Nanotechnology, Recent Trends in Nanotechnology, Applications of Nanotechnology, Biomedical Engineering and Applications. Two pre-conference National Symposiums has been scheduled during Nanotek-2014. Prof. Claudio Nicolini from The Fondazione Elba-Nicolini, Italy is organizing a pre-conference workshop on “Structural Nanoproteomics”, Dr. Dominique Ausserré, University of Le Mans, France, is organizing a pre-conference workshop on “Coupled optical and electrochemical monitoring of working eletrodes in electochemistry research” and Prof. Ashok K. Vaseashta from International Clean Water Institution, USA organizes a workshop on “NT4W-Nanotechnology for Water Generation, Contamination Detection and Purification”. Asia pacific based ‘Asian News Channel’ that provides 24/7 News & Feature service for Asia Pacific and Africa Region acts as a collaborator for this scientific event, while ‘American Elements’, a global manufacturer of several Nano-material including nanoparticles, nanopowder, nanotubes, nanowire, quantum dots, submicron, -325 mesh, etc., and The PlasmaChem mainly concerns nano-materials, detonation, vacuum, plasma and ultra-thin film technologies and their biomedical and technical applications. Sponsors the advertisements. OMICS Group International is an open access publisher that publishes 400, Peer Reviewed Journals in the fields of Clinical, Medical, Engineering and technological, Pharmaceutical and Management fields. OMICS group hosts more than 300 International conferences and events across the globe. With the help of more than 150 scientific associations. Besides this OMICS Group also encourages the business collaboration and interaction through its B2B and Scientific Meetings.On behalf of Nanotek-2014, OMICS Group is glad to invite contributions from the enthusiastic participants to organize International Workshops that are both empirical and conceptual in exploring new dimensions in this field. It is open to all types of research methodologies both from academia and industry.